Migrating Geese – Let's Paint Nature! Geese? I think they made a left turn. This picture was taken after watching thousands of geese migrate at sunset. 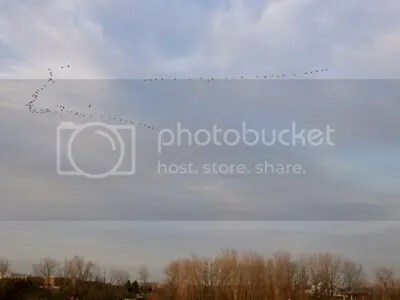 It looks as if these geese are pointing in the direction of their flight pattern. The interesting part was that every group was flying in the same exact direction, Northwest. Every minute or two another flock flew over the same way! This went on for hours. Hi Chris, WOW! That’s amazing – what a sight it must have been and the honking, too, must have been incredible. We should be seeing geese here anytime now, and YES, I can hardly wait for Spring to finally arrive. Your picture is very pretty with all those wonderful colours. That is cool – a combination of being at the right spot and the right time and….having a camera! Sure sign of spring to see the geese migrate. Nice photo. Alan: No kidding! Right time to be there…I had to laugh when I saw that! Joan: Thank you! Spring migration is so exciting. Charles & I watched an evening mini-migration once a few years back. The birds were so high up we couldn’t tell what they were (I suspect gulls of some sort, going to roost at the end of the day.) We watched for well over an hour or two & the birds just never stopped. There had to be tens of thousands of them, & no one else even noticed. Had anyone lifted their eyes even once, they would have had this small miracle to watch, but they were all too busy with their lives.